Yes, I have lots of games. But do they use OpenGL? You're on Windows, so they might just be DirectX. I've spent an hour researching your rendering issues. I think they're fundamentally mostly the same (the error messages seem fairly similar) - missing buildings with just an outline rendered, black terrain or the no-show of the water - they're all shader compilation errors, and they're independent of rendering framework (i.e. are observable in ALS and outside) just the symptoms are different. The only genuinely different things are the red buildings and the z-ordering problems. * I'm seeing none of them, which isn't overly surprising in itself, NVIDIA drivers are fairly permissive, ATI/AMD not necessarily so, so sometimes bad GLSL slips by me and causes issues. Usually the error message is descriptive enough to fix it - but not here. * The cause reported by the error message (dual definition of a main function) is definitely not the actual cause - none of the affected bits of code declare two main function. The line reported for the message is the declaration of the main function in all cases, but there has not been a main function before - not clear what happens. * I can't see any common theme among the affected shaders - it's agriculture for ALS, water for ALS and non-ALS, buildings for ALS and non-ALS so far, possibly more. Agriculture has last been modified Dec. 2014, so before the 3.4 release. water-sine.frag has last been modified Nov. 2013, i.e. before the 3.0 release. There's no change FG-side which could explain why these shaders stopped working for you when they did in 3.4. * While I might miss some ATI/AMD specific subtlety, Emilian (who made the last changes to the non-ALS variants) is far less likely to do so and I believe he has access to ATI/AMD architectures to test - the fact that his work shows just the same issues makes it further unlikely that this is a combination of simple slips on my side. Thus, at this point the evidence would suggest some change on your side, leading to some weirdness (otherwise, I can't for the sake of it figure out why code that hasn't changed since 2013 should suddenly start to not compile). So, I don't know what is going on, and I don't have any leads to investigate the compilation errors further, but I suspect based on th fact that things which haven't changed stopped working that it's not FG-side. A suggestion to proceed by trail and error would be to try to up-/downgrade drivers - there are some reported cases for ATI/AMD architectures where this solved problems. Or maybe someone else can see what I'm missing. Yes, I play OpenGL games like UrbanTerror, Minetest, Counter-Strike, GLQuake, Quake II, Return to Castle Wolfenstein and other (no glitches for these games). A suggestion to proceed by trail and error would be to try to up-/downgrade drivers - there are some reported cases for ATI/AMD architectures where this solved problems. Or maybe someone else can see what I'm missing. I will upgrade to latest ATI drivers and report here. BTW, you said there is -warn level that will output errors in console, but where is console itself? I'm not sure (Linux here, haven't looked at Win for six months) - probably --console added to the commandline gets you one. Thorsten wrote in Sun Aug 09, 2015 2:36 pm: I'm not sure (Linux here, haven't looked at Win for six months) - probably --console added to the commandline gets you one. Emilian gave me a pointer to indexing issues - these may explain at least part of what you see (buildings and water compilation errors). I have still no idea where the agriculture problem comes from (doesn't look like the same cause), but then again, you couldn't reproduce that one. Pic: https://i.imgur.com/KGDK2Ea.png (at other levels it is ok, even on MAX). Fragment shader(s) were not successfully compiled before glLinkProgram() was called. Link failed. Red buildings bug is present as usual. WTF?! What's there to misunderstand? You gave a negative answer to a clear question asking you to try to reproduce the problem where you first observed it. OK, I explain again: agriculture error appears only if agriculture custom setting is turned to maximum on UKON airport. Landmass and transition settings does not produce agriculture shader error. 30) Related to buggy load tape: if I end the replay of at least 3.4 recording, my cessna falls like a rock, wings damaged etc, but when I reload or load another tape, it looks damaged even on reload. 31) On recorded tapes from 3.6 when I take controls of my cessna, its engine stops, so I need to restart in flight. I'm not sure if this has been covered here or not, but if I run fgfs without the KSFO scenery in FG_SCENERY directory, then the loading screen gets to the loading scenery part and just stops with no error message. 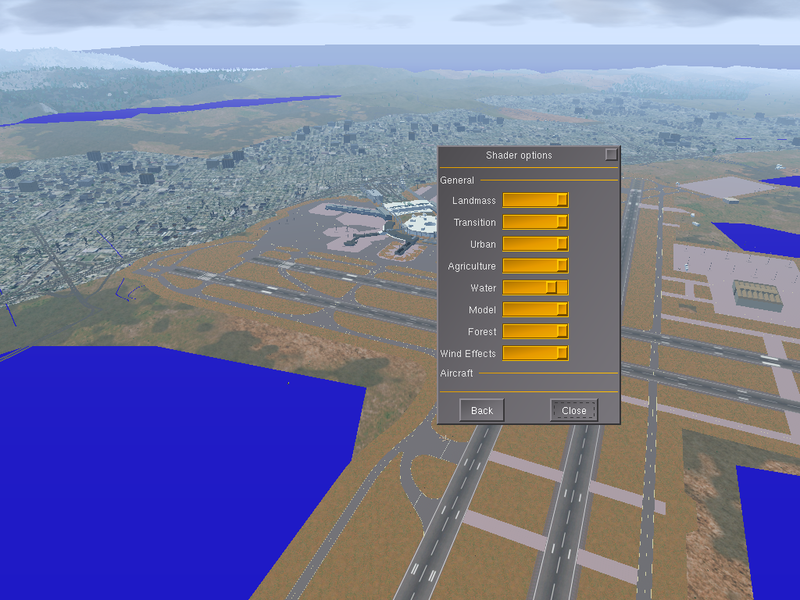 I've been trying unpacking just a few of the scenemodel tarballs (as I've been having trouble with water over runways in terrasync) and ran into this. Interesting... I've had sort of a similar problem, and we never got to the root of this. Can you describe exactly what is needed to reproduce this and make it go away again? Is this using/not using terrasync, pointing the scenery directory how,...? Terrasync is off. Set FG_SCENERY to a new directory. 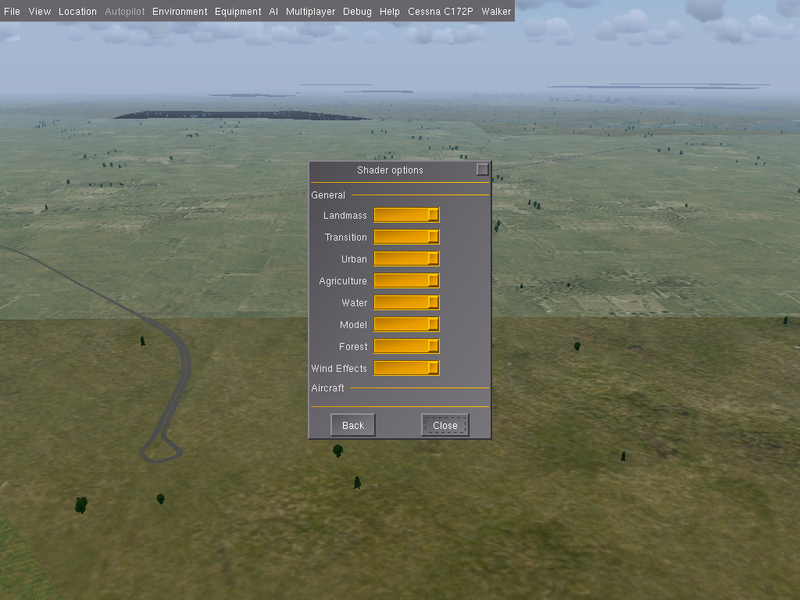 In new directory, unpack GlobalObjects.tgz, SharedModels.tgz and a scenery pack not near KSFO (w010n50.tgz for me). 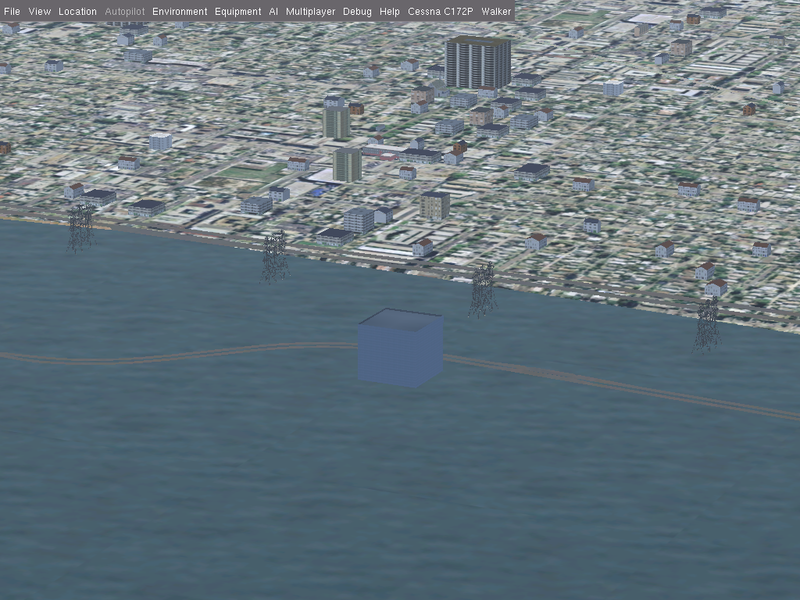 Then try and load fgfs without any options to start you at KSFO. That doesn't necessarily have something to do with KSFO then - what happens if you ask FG to start at any other airport which is not installed? Well, it does seem to be anywhere that there is no scenery info for. Tried a few remote airports and same thing. You get the "loading scenery" with the spinner going round and round, but no end. The menu at the top comes up and you can see where you are on the map though. note that the scenery engine/tile cache is multi-threaded, so if something seems non-deterministic/hard to reproduce, that may be part of the reason.